Phase locking for two ytterbium-doped large-core fiber lasers has been demonstrated by using a selfimaging confocal resonator with a spatial filter. Steady high-contrast interference stripes are observed. The visibilities of coherent and incoherent stripes are 59% and 6%, respectively. The measured width of the central strip is in good agreement with the calculated result. For in-phase mode, the output power of the phase-locked fiber laser array is up to 113 W and corresponding slope efficiency is 38.5%. OCIS codes: 060.2320, 140.3290, 030.1670, 070.6110. Recently, with the development of industry and communication, higher quality and higher power of laser beam are required by means of beam coherent combination techniques which can improve power of beams with excellent quality. Fiber lasers are applied widely in beam combination techniques because of the advantages of compactness, convenience and efficiency. Nowadays, researchers have presented many beam combination techniques with fiber lasers, including the master oscillator power amplifier (MOPA) arrangement, the all-fiber coherent technique, the self-organization of multicore fiber, and the self-Fourier (S-F) cavity[1?4]. However, these experiments have been operated under low power level. The spectral combining approach, which uses a volume Bragg grating (VBG) of dispersive element to combine two fiber laser beams in both near- and far-fields, requires each fiber laser working at a slight different wavelengths. For various operation media such as Nd:YVO4 and Nd:YAG, coherent addition of laser array beam has been demonstrated by the use of selfimaging resonator[6,7]. The self-imaging resonator is a special Fourier cavity and phase locking of various lasers have been realized by using Fourier cavity[8?10]. Phase locking of fiber laser arrays with a self-imaging resonator have been also realized under low power condition[11,12]. In this method, phase correction of fiber lasers is passive, which is realized by means of self-adjusting process of the resonance frequencies of fiber laser arrays to adapt to change in the optical path lengths. Furthermore, this method does not need polarization controlling of each fiber laser beam, because a polarization eigenstate can always be found in the two elements system regardless of relative orientation. Using this method, a number of fiber lasers with different lengths are coupled into a common self-imaging resonator with a spatial filter for phase locking. For improving coherent output power of the phase locked fiber laser array, power scaling of the single fiber laser is a feasible approach with an identical self-imaging resonator. A large-core fiber is geometry of choice for power scaling of double-cladding fiber (DCF) lasers and a large-core fiber laser with 1 kW of continuous-wave (CW) output power has been reported. For end-pumped configuration of fiber lasers, a large inner cladding is necessary to accommodate the large pump beam for high output power. A large core is also required to mainly be due to degrading background loss, suppressing nonlinear-scattering. In this letter, we describe further power scaling of the phase-locked fiber laser array with a self-imaging resonator to a in-phase mode power of 113 W. For this to be possible, we use a higher pump power and a largercore DCF than before. Steady interference stripes with visibility of 59% are observed. Our experimental setup is illustrated in Fig. 1. Two diode array lasers with emitting wavelength of 975 nm are used as pump sources in the phase locking experiment. 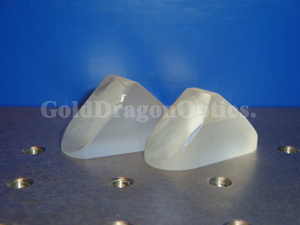 Pump beams from diode array lasers through two spatial filters are coupled into ytterbium-doped DCFs by using two aspheric lenses, which are end-pumped configuration for the two fiber lasers. Two ytterbiumdoped double-cladding D-shape fibers with a core diameter of 30 μm and an inner clad diameter of 400/450 μm for the shorter/longer axis are used as active media. Both the two fibers were drawn from the same preform. The fiber lengths are 13.4 and 11.6 m, respectively. The nominal numerical aperture (NA) is 0.16 for the core and 0.37 for the inner cladding. The self-imaging resonator consists of two flat dichroic input mirrors (M1 and M2) with high reflectivity of > 99.8% for 1080?1150 nm and high transmission of ～ 95% for 975 nm, a convergent lens (L3) with focal length of f = 500 mm as Fourier transform lens in this system, and a flat semitransparent output mirror (Mo) with 25% reflectivity for 1080 ? 1150 nm. M1 and M2 are attached to the input end of fibers, and the other ends of fibers are perpendicularly cleaved with 4% Fresnel reflectivity. Two identical plano-convex lenses (L1 and L2) are set on the output end of fibers as the collimators. The diameteres of lenses (L1 and L2) with the focal length of 6.3 mm are 4 mm. 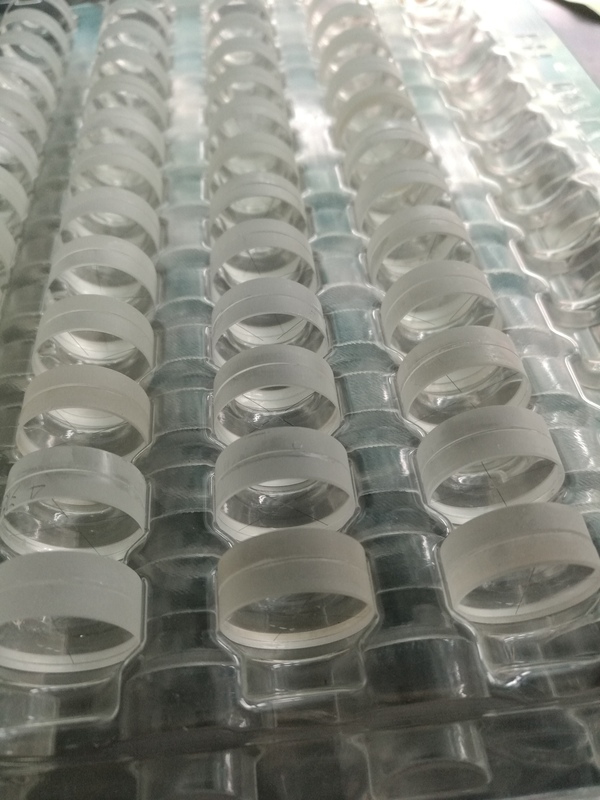 The collimated beams are placed symmetrically about the resonator optical axis on the front focal planes of Fourier transform lens and the spacing between the two individual fiber output ends is 4 mm. The semitransparent output mirror Mo is set on the back focal panes of L3. We examine the beam profile of the output beams at Mo by means of a CHOU4810 charge coupled device (CCD) camera and a laser beam analyzer (LBA-PC300; soft version 3.23; Spiricon Inc.). Since the beam profiles at the front focal plane of L3 and at the output plane of the system are related to each other through a Fourier transform, a beam profile symmetrically about the optical axis reproduces itself after a round-trip in the resonator and two counter-propagating waves are coupled each other. To stabilize the phase relation, we place a single platinum wire as the spatial filter in front of the output mirror to create higher loss for the out-of-phase mode. By using a simple theoretical model, we have calculated the loss for in-phase and out-of-phase modes created by wires with two different diameters in Table 1. 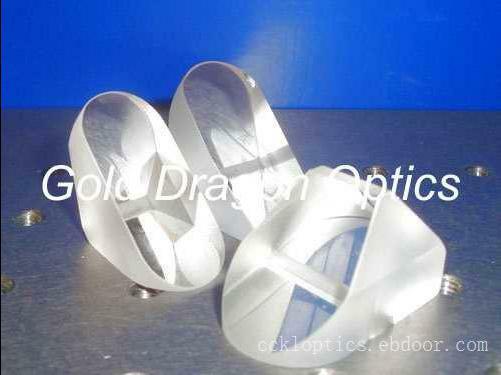 The calculated parameters are 6.3 mm of diameter of the collimator and 4 mm of spacing between the cores. From Table 1, we can see that a 10-μm wire at the first intensity minimum in the in-phase modes would introduce a 6.8% loss to the out-of-phase modes and 0.05% to the in-phase modes, and a 20-μm wire would introduce a 12.3% loss to the out-of-phase modes and 0.27% loss to the in-phase modes. Therefore, the best effect is achieved with the wire at the first intensity minimum of the predicted mode patterns. For easier handling, a single platinum wire of 20 μm is placed at the 1st intensity minimum of the in-phase modes in this experiment. When the fiber laser array is in free-running, the beam profile exhibits low-contrast interference stripes that are constantly moving with irregular pace and direction and the visibility is 6%, as shown in Fig. 2(a). The beam profile of the laser array for in-phase modes is shown in Fig. 2(b) and the visibility of stripes is up to 59%, which shows that the phase locking of two fiber lasers are realized. We can calculate the width of interference stripes by a theory model. The calculated width of the central stripe is 128 μm and the measured result is 126.4 μm shown in Fig. 2(b), which are good in agreement with each other. 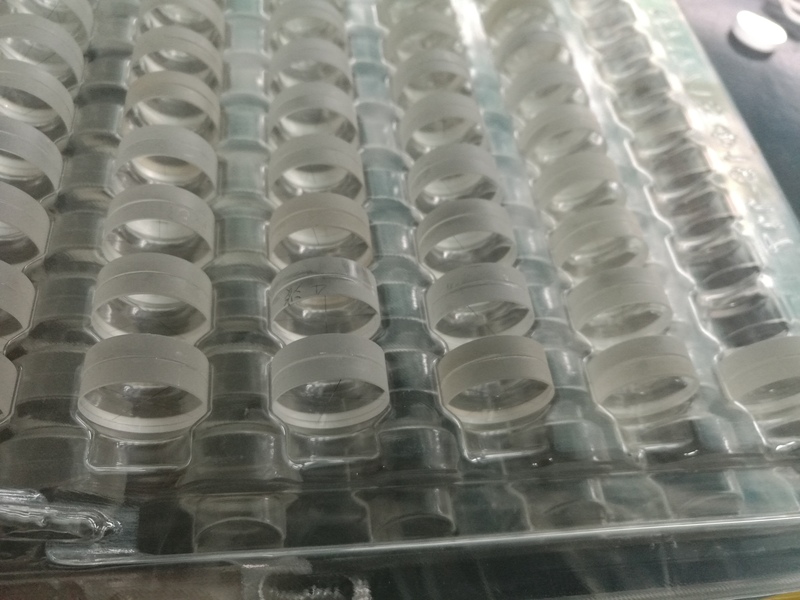 Because of the self-adjusting ability of the fiber laser array with the self-imaging resonator, the phase locking is stable even when the optical lengths are deliberately changed and mechanical perturbation is added. For example, no slight stripe movement is observed when the temperature of one of the fibers is increased 10 degrees, or when one of the fibers is bent slightly. 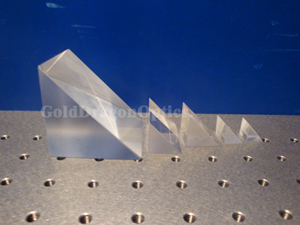 Generally speaking, the self-adjusting process does not easily occur, but performs the best in laser systems with broad gain bandwidth, long and unequal lengths, and low-Q resonator. Fortunately, the fiber laser array occupies these favored conditions. The output power against pump power of the two individual lasers are shown in Fig. 3(a). The slope efficiencies are 47% for fiber laser1 and 41% for fiber laser2, respectively. The results are higher than that obtained in Ref. and are close to that obtained in Refs. [11,12,16]. The output power of the laser array divides into two cases: total output power and in-phase mode output power, where total output power is a measured result when the laser array is in free-running without the spatial filter and in-phase output power is also a measured result when the laser array with the spatial filter in place is under phase-locking condition. From Fig. 3(b), we can see that the slope efficiencies are 38.5% for in-phase modes and 39.7% for all modes. In Fig. 3(b), when the pump power is up to 293 W, the maximum in-phase output power of 113 W of the phase-locked fiber laser array is obtained and, for all-modes, the total output power of the fiber laser array is 118.2 W. This result is up to now the highest in-phase mode output power with the same method. Fortunately, no thermal effects for the spatial filter are observed, which shows that the further coherent power-scaling is possible by means of this method. In summary, we report phase locking of two ytterbiumdoped double-cladding large-core fiber lasers with a selfimaging resonator. Steady high-contrast interference stripes with visibility of 59% are observed. When the fiber laser array operates within in-phase modes, the slope efficiency is as high as 38.5%. For pump power of 293 W, the in-phase output power of 113 W is obtained. This work was supported by the National Major Fundamental Research Program (973) of China (No. 61359020103) and by the National High Technology Research and Development Program (863) of China (No. 2005AA802030). B. He’s e-mail address is bryanho@mail.siom.ac.cn.